On a spur-of-the-moment decision, my husband and I decided to buy plane tickets to spend a long holiday weekend in Maui. One morning at work, my husband texted me and told me that roundtrip tickets to Hawaii were on sale at a price you just can’t refuse. Not more than 15 minutes later, we were on the phone and purchasing the tickets. This trip we never planned to go on, but just couldn’t say no to. So, next thing I know, we had a 4-day, 3-night trip to Maui booked and paid for. In a crazy twist of fate, this would be the third consecutive year in which we would be flying to Hawaii for vacation, though our first trip to Maui. We decided to stay in a hotel along Ka’anapali Beach so after landing at Kahului Airport, we picked up our rental car and were driving down the highway. Since we departed Los Angeles early on a Saturday morning, with the difference in time zones, we arrived in Maui just before noon. This was the perfect time for us to stop off in Lahaina on our way to our hotel to grab lunch before we settled in. 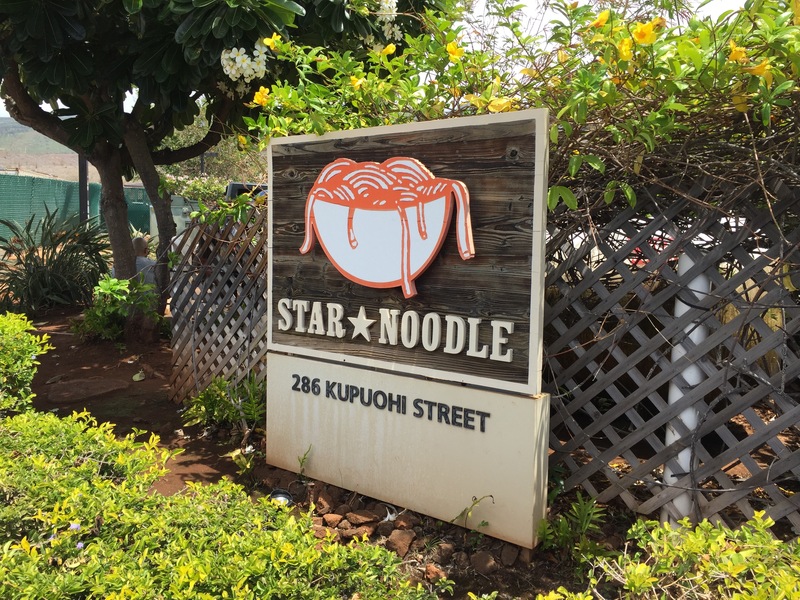 We had made lunch reservations at an extremely popular restaurant just outside of the main area of Lahaina at a restaurant called Star Noodle. Featuring small shared plates and specializing in homemade Asian noodles and flavors, this popular Maui restaurant has gained so much popularity that there’s always a line forming each morning when the restaurant opens. Our waiter told us that one of the things that made Star Noodle’s food so amazing is that the owner of the restaurant also runs a large daily luau operation in Lahaina as well as another large restaurant and making fresh noodles daily as a supplier for other restaurants, these are resources that Star Noodle can draw upon to bring in only the best and freshest daily ingredients that are used exclusively for this restaurant, which was opened as an after thought when guests suggested that instead of making noodles for other restaurants, they start serving at their own restaurants. Located at the top of a hill in an industrial business park, the indoor dining area of Star Noodle is light, bright, airy and decorated in rich wood tones and bamboo accents. The dining room features an open bar with bar seating and both small and large tables that never seem to be empty. After flying in from Los Angeles, and driving from the airport in Kahului to the restaurant in Lahaina, my husband and I were ready for something refreshing to drink. We both decided to order the watermelon soda made from fresh watermelon combined with fresh pressed lemonade. 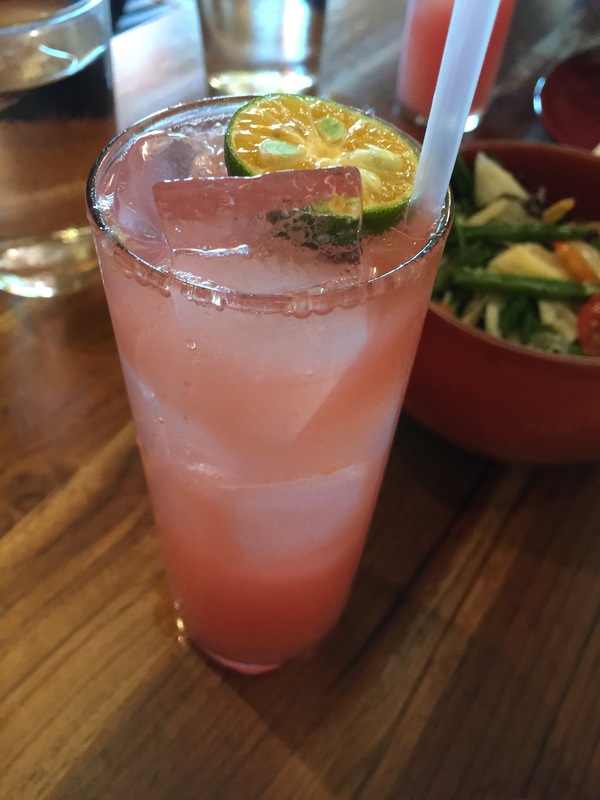 The presentation of the drink was gorgeous and looked almost like a pink lemonade with just a hint of the reddish watermelon pulp mixed with tart, tangy fresh lemonade. The drink was quite refreshing and cool with the flavor of watermelon prominent through the drink. The drink tasted fresh, like it was just made fresh that day and mixed together by the bartender once ordered. The flavor of lemonade was light, and though prevalent through the drink, it was second fiddle to the watermelon juice, which created a beautiful combination of sweet watermelon juice combined with just a hint of a tangy lemonade mixer. Refreshing is definitely the word to describe this drink. Our waiter had told us that all of the items on the menu were meant to be shared family style, or more like tapas style. His suggestion was that one bowl of noodles would be good for two people and 3-4 other small shared plates would make a good meal. So after perusing through the menu and taking into account a couple of the suggestions that he made for us, we were ready to order. We started off with the Pohole salad. We were told that this was a unique salad only found here on Maui and a Maui speciality that was so traditional that you rarely found it on any restaurant menu anymore. With that kind of a description, we couldn’t resist ordering the Pohole salad, if only to enjoy an authentic Hawaiian dish. The salad is made with Hana fiddle head fern, Maui onion, Ebi and Kombu. The salad had a flavor and texture unlike anything I had ever tasted before, it was unique and different, but packed full of flavor and quite delicious. The fiddle head fern from the Hana region of Maui was delicious. The ferns were somewhat reminiscent of asparagus with the same crunch and body, which allowed it to take in the flavor of the dressing, but without going limp. If you’ve never had Maui onions, you’re missing out as these sweet onions are unique and have a flavor all of their own. The crunch of the Maui onion is fantastic, but with a sweet flavor you wouldn’t expect. Combine all of that with some acidic cherry tomatoes, Kombu, which is an edible kelp which provides a natural saltiness to the salad without having to add salt to the salad, and the unique flavor of Ebi which is dry roasted small prawns, the salad had a unique flavor all its own. 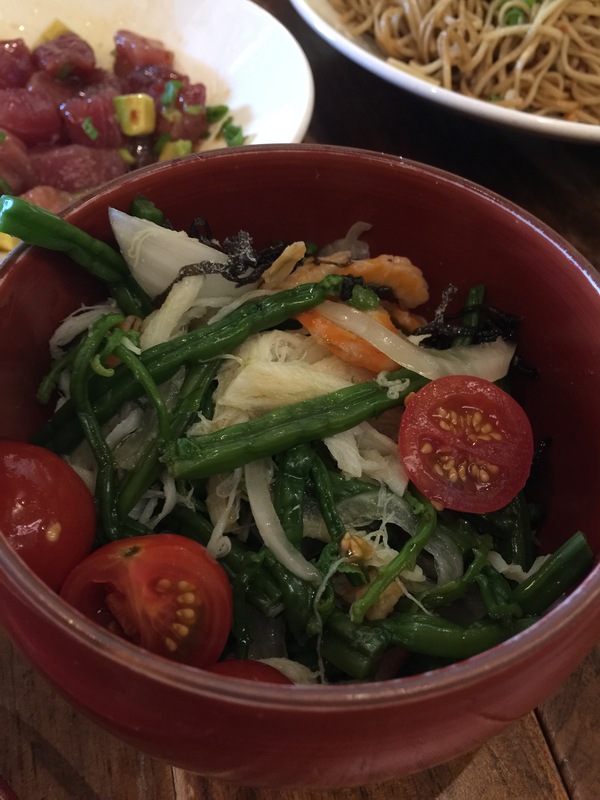 The ingredients gave the salad a mainly sweet flavor, one I didn’t expect, with just a touch of saltiness and the briny flavor of the ocean that could only come from the Ebi and the Kombu. This is definitely a salad you need to taste. My selection for a small plate was the scallop shot. 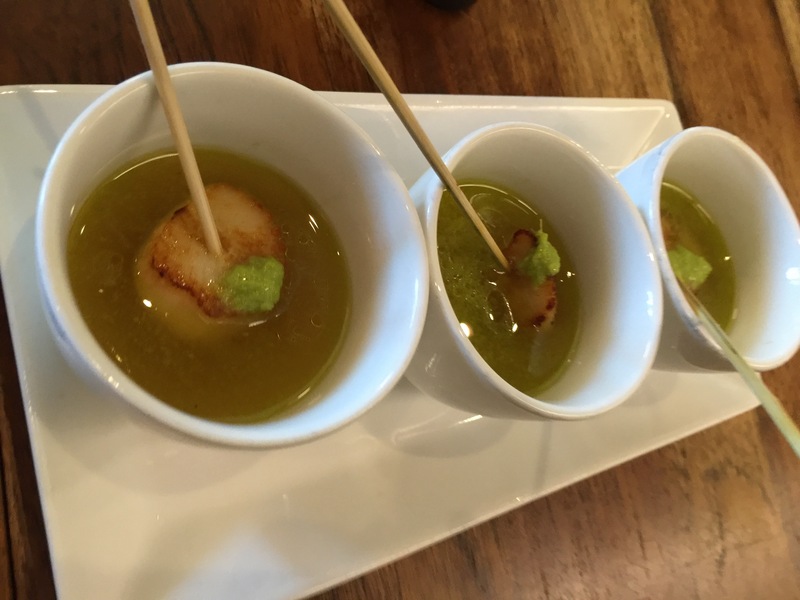 Made with grilled scallops attached to a wooden skewer, the scallops are placed into a small tea cup filled with wafu dashi, scallion, lemon and extra virgin olive oil with a little dollop of fresh grated ginger placed right atop the scallop. 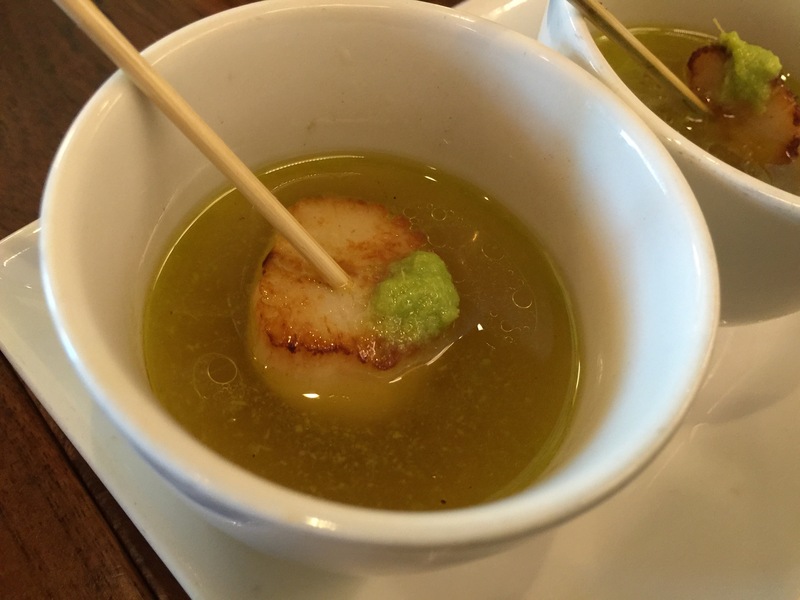 The idea is to use the skewered scallop as a stirrer to mix the grated ginger into the warm “broth” in the tea cup and distribute the flavor, then pop the scallop into your mouth and chase it down by drinking the broth in the tea cup. I loved the uniqueness and creativity of the dish. The scallops were perfectly grilled with a nice sear on the outside. The flavor of the broth really soaks up into the scallop giving it a unique taste that combines with the natural sweetness of the scallops. The broth though is really what makes this dish unique. The flavor of the broth is rich and strong with a pronounced flavor of ginger. My husband and I both love ginger, so we loved the bite of it in the broth. The combination of the dashi and the scallion with just the hint of lemon combined with the extra virgin olive oil created a warm, rich, tangy and acidic broth with a bite of ginger that was warm and unique. This was a one-bite dish that was so much more than just one bite. Our next small bite was the yakitori. 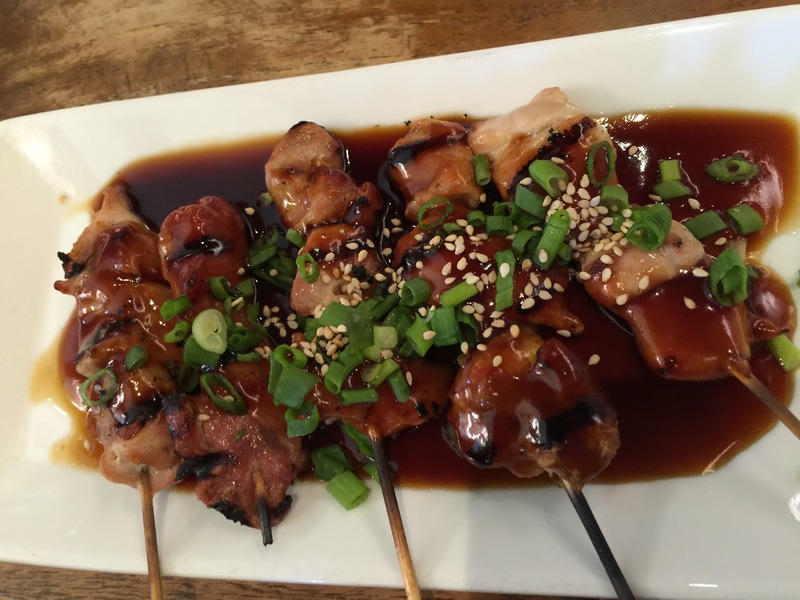 Made by grilling cubed chicken that has been skewered, it is then served with teriyaki glaze, and topped by diced scallions and sesame seeds, yakitori is a very common Japanese dish. The chicken was tender and moist and the teriyaki glaze was quite flavorful. This yakitori dish was the epitome of a small plate, a two-bit chicken skewer that was perfect to share with my husband. There was nothing particularly spectacular and earth shattering about the dish, other than it was very well done. But when you order yakitori, you know exactly what you’re getting, and that’s exactly what we got. For our one noodle dish, we decided to order the garlic noodles made with fresh and fried garlic, garlic oil, dashi and scallion. Simple with very few ingredients, we thought that this would really show off the flavors of the noodles and the garlic. Besides, my husband and I are both a love of garlic, and our motto is, the more garlic the better. I see why they tell you to just order one noodle dish between two people because the noodle dishes are bigger than the small plates, and like any other starchy dish, the noodles are quite filling. And as described, this noodle dish was quite simple with so few ingredients that it really showed off the noodles themselves as they were the star. First off, we could definitely taste the garlic flavor and it was fantastic. Using a combination of fresh and fried garlic was perfect, the fried garlic was crispy and gave some varying texture to the noodles themselves. But it was really the garlic oil which permeated and clung over all of the noodles that really added the garlic flavor to the dish. The diced scallions added the subtle tang of onion to cut through the rich garlic flavor. The noodles themselves were fantastic, they tasted fresh and homemade. They were perfectly boiled and weren’t limp so they really soaked up the garlic oil. This was just a fresh and delicious dish. Our final dish at lunch was chosen by my husband. Originally, I wasn’t keen to order the dish at all and my husband was really interested in it. What made the decision for us was when our waiter said that this dish was Star Noodle’s best and most popular dish. It is a dish they make once a day using the supplies that they have, and once it’s gone, it’s gone, so if you don’t get your hands on it, you may not get a chance. The ahi avo is made using fresh sushi-grade ahi tuna mixed with lemon pressed olive oil, sambal and usukuchi. Our waiter told us that since Star Noodle’s parent company owns so many different restaurants and catering services throughout the island they can fly in fresh fish each morning from Honolulu at the tuna auctions. For this ahi avocado dish, they take the best cut of ahi tuna possible with absolutely no fat striations whatsoever and they use that cut for the ahi avo dish. 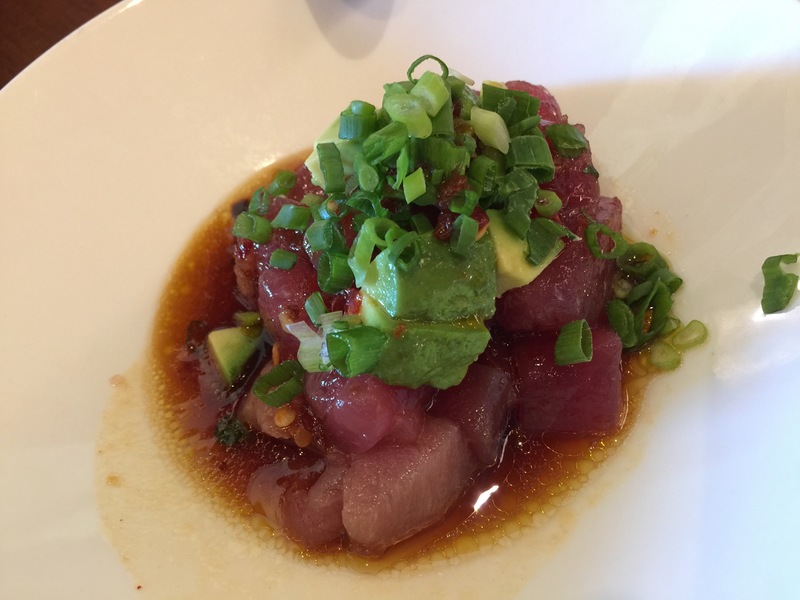 He assured us that we’d never taste a more perfect piece of ahi tuna in our lives. With that kind of description, how could we not order this dish? Originally, for me, the reason I wasn’t interested in order the ahi avo was because it was made with sambal, which I find to just be too spicy for me, but the waiter said that the dish wasn’t really that spicy at all. 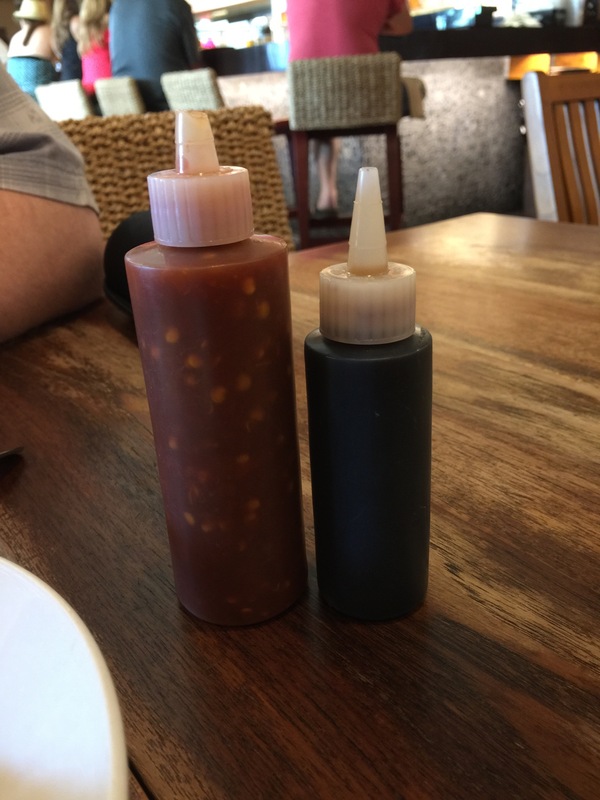 In fact, when the dish was delivered to the table, they also gave us extra bottles of sambal and usukuchi in case we wanted to add more of either to flavor the dish to our liking. The cubed pieces of ahi tuna in the dish were amazing, just as the waiter had told us it would be. The fish was so incredibly fresh and I’d never tasted a better piece of fish in my life. Just as promised, the fish had absolutely no striations in it whatsoever, and these were nice meaty chunks of fish, not small cubes. The combination of the fatty, delicious fish with the tender, creamy avocado was perfect. The “sauce” created from the sambal and the usukuchi was terrific and wasn’t spicy at all. The usukuchi added the nice bit of saltiness the dish needed to cut through the fatty fish and the creamy, cool avocado. This was an absolutely fantastic dish and my husband and I couldn’t help rave over this dish. This dish is a must order. Star Noodle was a star restaurant choice for our first meal in Maui. The vibe and atmosphere of the restaurant was open, airy, bright and comfortable and laid back and relaxed, reflecting perfectly the temperament of the island itself. But the real star of the restaurant is the food. The small plates are perfect for sharing and allow you to order a wider variety of foods. Many of the dishes offered feature ingredients that are local and fresh and you can taste the freshness in the food itself. Highlight ingredients such as fresh ahi tuna, Hana fiddle head ferns, Maui onions and many other ingredients, many of the dishes at Star Noodle are a reflection of this beautiful island of Maui. And the ahi avo, the star of our lunch at Star Noodle was just beyond amazing. Anyone would be silly to turn down the quality of the ahi tuna and the freshness of it, you’ll never have fresher, more higher quality fish. 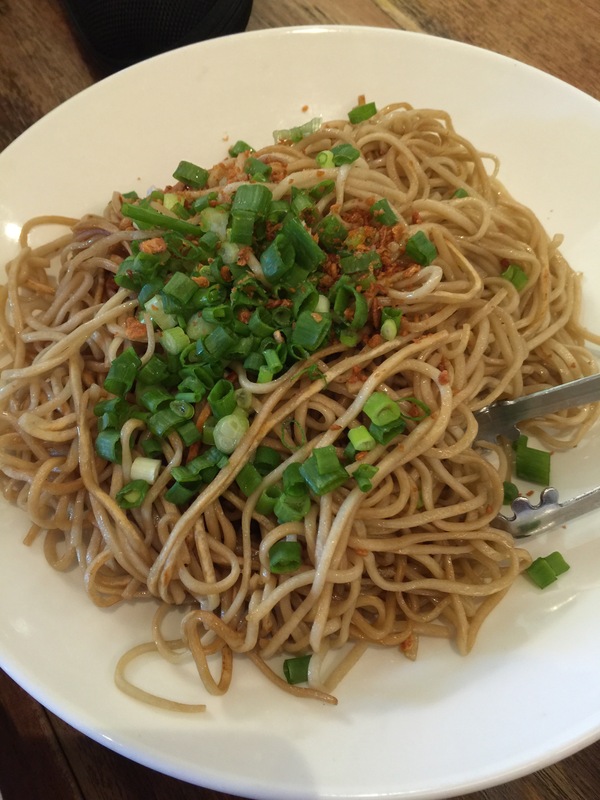 If you like Asian fusion cuisine, fresh noodles and small shareable plates, then Star Noodle should find its way onto your must eat list when visiting Maui. All of this looks really, really good.